This homemade kahlua cake is so easy and completely from scratch. Rich, dense chocolate bundt cake is flavored with Kahlua, soaked in a Kahlua syrup after baking, and finally covered with ganache — first a Kahlua Dark Chocolate Ganache then a Kahlua White Chocolate Ganache. I first published this recipe in 2012. I’ve changed a lot since then — my photography is better and I’ve updated the cake, too.If you liked the old recipe I think you’ll like this one even better. I made the flavors darker and more intense, added a soaking syrup, and topped the whole thing with ganache. It’s prettier than ever, I think. You can find the old recipe and images at the bottom if you want to do a comparison. I’ve used a newish product, Kahlua Especial. It has a more intense coffee flavor than regular Kahlua and a higher alcohol content. If you can’t find it locally I’ve linked to it below. I love Kahlua. Almost as much as Baileys, as a matter of fact. In essence, I am saying that I like sweet, dessert-like, girly drinks. That works fine for me and always has since I am, of course, a girl. The idea of a Kahlua cake holds so many possibilities. Chocolate Kahlua? Spice Kahlua? Vanilla Kahlua? I think I have decided on all of the above but, as always, chocolate comes first in my life. I noticed that it’s pretty tough to find a recipe for Kahlua cake from scratch and not a mix. Well, this chocolate Kahlua bundt cake is a from scratch Kahlua cake. I know that cake mixes are handy and all but I just don’t like the idea of not knowing exactly what’s in them or how to pronounce it. You are rarely going to get convenience food recipes from my blog – it happens but just not that often. The cake is moist, gets a chocolate boost from cocoa as well as bittersweet chocolate chips, has plenty of Kahlua flavor, AND is soaked in a Kahlua syrup and then covered with a Kahlua dark chocolate ganache then topped with a Kahlua white chocolate ganache. Helloooooo.If you have an hour this cake can be in your belly. All of it…because you won’t want to share. The following are affiliate links. If you click through and buy something I’ll get a small commission used for keeping the blog up and running smoothly. Thanks for being a part of Restless Chipotle! Here’s that chocolate Kahlua Cake recipe. 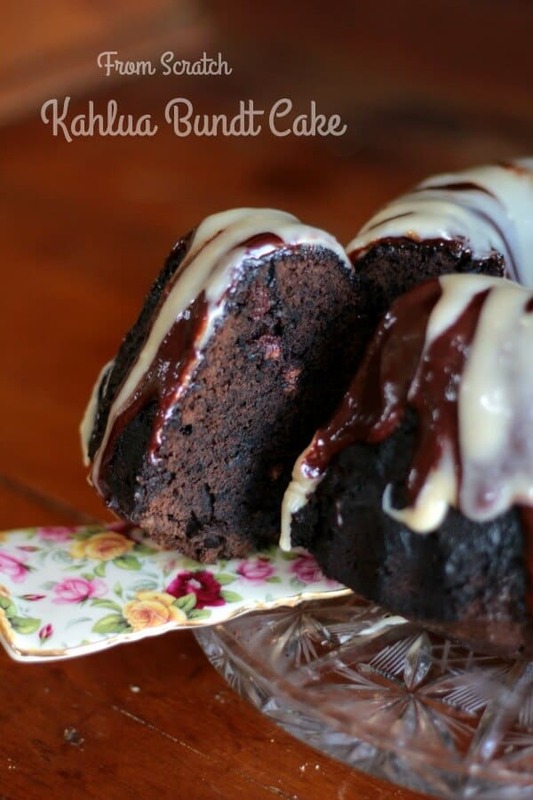 Rich Kahlua chocolate bundt cake that is easy to make from scratch. 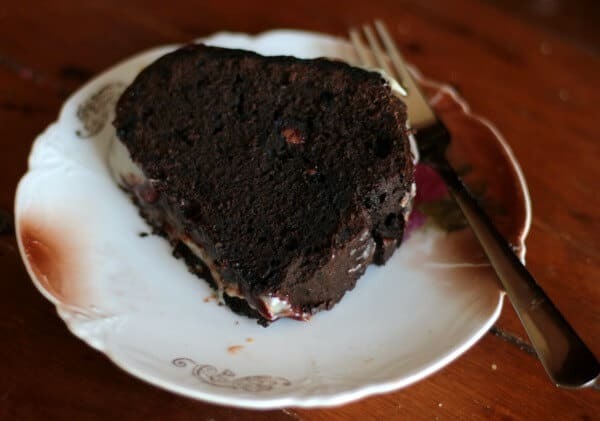 Deep chocolate and coffee flavor make this easy cake something every one will like. Grease a bundt pan thoroughly and then shake cocoa in it to coat. Add the sugar and brown sugar; continue to beat until blended. Mix the flour, cocoa, and salt. Add half the flour mixture and blend well. Fold in the 1/2 cup chocolate chips. Poke holes in the cake bottom and spoon 1/2 the syrup over it. Remove from pan and brush with remaining syrup. Drizzle with the dark chocolate ganache then the white chocolate ganache. Bring the Kahlua and sugar to a boil. Let boil for 1 minutes. Heat the heavy cream in the microwave until just under a boil. Stir in the chocolate chips until smooth. Add 1 tablespoon of Kahlua and stir until smooth. Follow the instructions for the dark chocolate ganache using the white chocolate chips. Stir the flour, cocoa, baking soda, baking powder, and salt together -- set aside. Beat the butter and sugar until they are light and fluffy. Add the eggs, one at a time, beating until totally incorporated before adding the next egg. Mix the 1/2 cup Kahlua, vodka, and vanilla. Add 1/3 of the flour mixture to the butter mixture, beating on low speed. Add 1/2 the Kahlua mixture. Repeat the flour and Kahlua steps ending with the last of the flour. Spoon into the bundt pan and bake for 1 hour, or until cake tests done. Cool in pan 10 minutes before turning out. Cover the warm cake with glaze and let cool completely. Stir in the white chocolate until it is smooth and melted. Stir in the 1//4 cup Kahlua. Dang- what a major bummer. Your recipe changed and it doesn’t make any sense!! I made the ‘old’ recipe for Christmas and it was a hit. Now, Saturday night I am making this for a Bridal Shower tomorrow. Well your recipes are all messed up and there is no link for the ‘old’ recipe, just photos. Look at your White Ganache recipe- it includes flour, baking soda etc…What the heck??? So I followed the recipe as it printed out and… I’m missing alot of ingredients that are in the Ganache part. Ganache is a topping not a base. I’m not a good enough baker to figure it out. too late now for the shower but I certainly hope you fix this one and do post the old recipe for future. The recipe code had become corrupt – Both cake recipes are on there since some readers loved the old recipe. just scroll through the recipe to get to the old one. It’s clearly marked. This looks absolutely delicious. 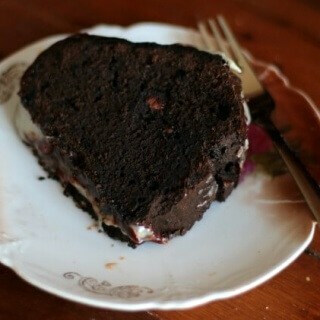 I love kahlua in cakes, something about it just screams comfort food. This sounds so delicious Marye! I love Kahlua! Gorgeous cake, I need a slice! Does this cake freeze well for a week to ten days?